This just may be the first time your child will decide what he or she will eat. And yes – school cafeterias have improved over the years, but there are still some options available to your child, which are less than healthy. Consider the potential access to vending machine or the fact that the child can actually decide to eat a hot dog day after day – unless you do some preliminary work and some serious training. You can continuously steer your child toward healthy choice – and if you start at a younger age, the results will be that much more positive. Explaining that nutritious lunch is the fuel they need to have a good school day and have fun with after school activities is a start. 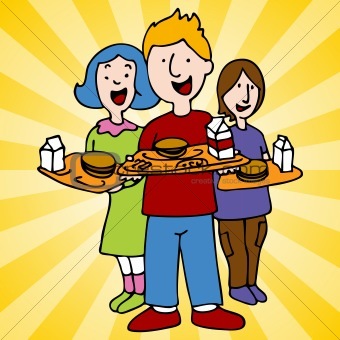 You can look over the school cafeteria menu together, pointing out items that are healthier than other while letting your child to choose their favourite item occasionally – even if it is a hot dog. Check out on availability of things like chips, sodas and ice cream – if they are readily available, you will need to discuss this with your child to make sure these items are not a daily habit. Do your best to continuously encourage cafeteria meals that include fruits, vegetables, lean meats, whole grains and avoiding fried foods when possible. Also – as far as drinks go, encourage low-fat milk and water, definitely not sodas or juices which are full of sugar. It will help to add healthy snacks that you children can take to school with them. Having them be a part of choosing and making snacks, that way you will be sure it will be eaten. Work on encouraging packed lunch – at least sometimes. Your child can participate in choosing foods for it and help to pack it as well – make it theirs. About Pre-packaged Lunches – They are very convenient and quite popular with kids and with parents. But they are also expensive and often less than nutritious. You will really be much better off creating packable lunches using plastic containers, re-sealable plastic bags or colourful plastic wrap. When packing lunches, please check with your school to make sure that you are aware of any restrictions on what kids can bring with them. Most school now forbid items like peanut butter, so if you are planning to make peanut butter and jelly sandwiches…. don’t! The bottom line is that you need to be in the driving seat when it comes to what your child eats – whether it is in the school cafeteria or with packed lunches from home – and you most definitely can be, because in a long run, it is for the health of your child. Hope you have enjoyed this information – please send in your comments, suggestions and experiences, your input is always welcomed and much appreciated! All great ideas Michele – thank again for sharing!And please feel free to comment and continue sharing! You’re welcome Hanna. I like to share. Did you mean for me to share it on this thread? sometime it’s a mix of chex cereal, nuts and some dried fruit. I love to put my favorite vegetable, chocolate in too. Sometimes chocolate chips, malt balls or m&m’s. Actually their are strawberry malt balls now! Kix is a good cereal to use as well. When I get a couple of almost empty boxes, of low or non sweet cereals I use them up in our trail mix. 1/2 c. Peanuts or your favorite nuts I love almonds and cashews (without the salt) You could use sunflower seeds or other seeds too. In a big bowl or little bowls and I’ll give out baggies to let everyone pick and choose what they want. Either way this is fun to make. My favorite proteins for trail mix are nuts. I want to try edamame, or roasted chickpeas and the yogurt covered peas. I think it may be a good substitute for nuts. I’m trying to think what would taste good with them. I’m still working on my energy bar. When I get it right I’ll share it here. I found this travel list on http://www.pbs.org/parents/kitchenexplorers/ and I inserted my own tips in parenthesis. I thought it would work for school lunches too for somethings to have in their boxes/bags along with a wrap or sandwich, or what have you. *Napkins, wet wipes and and extra bag for trash. Thanks Michele! Great addition to the snack list for sure – if you have recipes for the homemade trail mix or energy bars, it would be awesome if you would share it – I would be happy to post it with a note that it is from a mom who cares!